Details Azurite is a natural carbonate of copper usually described as a bright blue or sometimes as a greenish blue. Azurite varies in masstone color from deep blue to pale blue with a greenish undertone depending on such factors as the purity of the mineral and the grade (particle size) of the pigment. This fine grade (average 25 micron particle size) of azurite is a bright blue with a greenish undertone. According to some authorities, azurite has been found in paint pigment as early as the Fourth Dynasty in Egypt. Azurite is a natural carbonate of copper and is found in many parts of the world in the upper oxidized portions of copper ore deposits along with malachite. Our azurite is from copper ore deposits in Dzhezkgazgan, Kazakhstan. Despite azurite being a carbonate, and hence sensitive to acids, it has a good record in respect to permanence where employed in oil- and tempera media. It is darkened when exposed to sulfur fumes, especially where it is used in mural paintings. It is unaffected by light. Azurite pigment is said to turn green due to alteration to malachite. Although copper pigments tend to exert both a siccative and antioxidant effect in oil-medium, some examples have shown that azurite tends to discolor when applied in thick, coarse-textured layers. No data has been published on the oil absorption properties of azurite. 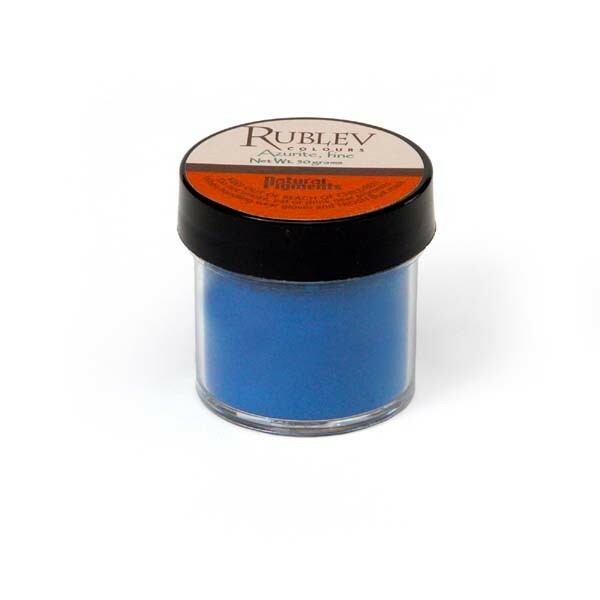 Coarsely ground azurite produces a dark blue pigment; fine grinding produces a lighter tone. 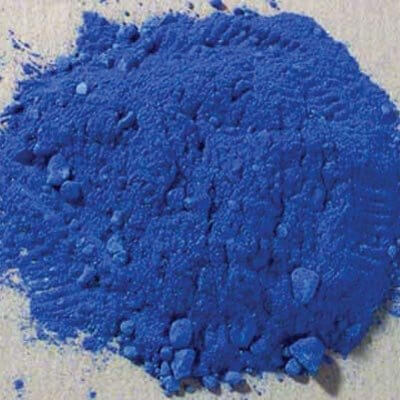 We offer a fine and medium ground pigment with an intense blue hue. Azurite is most successfully employed in aqueous medium, such as tempera, because of its refraction index. Azurite is moderately toxic and care should be used in handling the dry powder pigment as well as the pigment dispersed in medium.